NameJet and the XYZ.COM LLC Registry are offering 40 never before released domain names under the new generic top level domains (gTLDs) .XYZ and .COLLEGE in a group of advance auctions. As leaders in innovating the domain name space, NameJet and XYZ.COM have partnered to offer some of the very first new generic top-level domains (gTLDs) to the public this month. These never before released domain names are being offered by the new Top Level Domain Registry XYZ.COM LLC, in a groundbreaking advanced auction format prior to the release of the TLD to the open market in 2014. 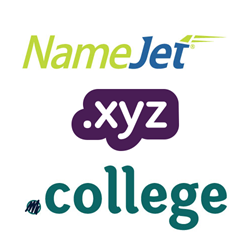 Forty premium .XYZ and .COLLEGE domain names will be offered in this first-of-its-kind advance auction, demonstrating how NameJet and the XYZ.COM Registry together are leading the way in the new gTLD marketplace. In an advance auction, the highest bidder purchases an option to acquire the domain at the winning price, taking possession of the domain when it becomes available at the registry. The first of the advance auctions begin on November 6th, 2013, and the last of the 40 domains will be auctioned by February 28th, 2014. “We’re excited to be taking a leading role in the release of these high quality generic top level domain names. NameJet is proud to be on the cutting edge of this major change to the Internet, enabling businesses and offering investors with the opportunity to acquire some fantastic names,” said Matt Overman, General Manager of NameJet. In addition to offering these advanced auctions for the registry, NameJet will also oversee both the Sunrise and Landrush auctions for the .XYZ and .COLLEGE launches. NameJet is a joint venture between Demand Media, Inc. (NYSE: DMD) and Web.com Group, Inc. (Nasdaq: WWWW), who each own two of four leading ICANN-accredited registrars (eNom, Name.com, Network Solutions and Register.com). Launched in 2007, with core auction software and technical infrastructure operating since 2004, NameJet serves domain investors, Fortune 500 companies and their representatives, small- and medium-sized businesses, as well as a diverse and global mix of individual investors. It has processed over 200,000 domain auctions, establishing itself as a trustworthy and transparent auction platform that is customer-focused and user-friendly. XYZ.COM is currently accepting preregistration requests for .xyz and .college domain names at XYZ.COM and XYZ.COM/college. Both unrestricted extensions will be available for registration in 2014. Institutions and trademark holders will have the opportunity to register their .xyz and .College domain names in the sunrise periods, followed by advanced registration with no trademark requirements. The final registration period will be treated on a first-come-first-served basis to the general public.